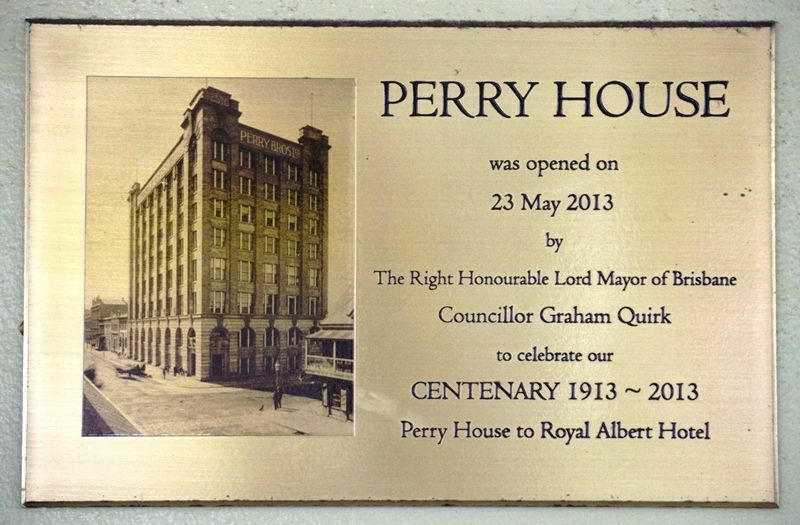 The plaque commemorates the centenary of Perry House from 1913 to 2013. The construction of Perry House occupied a considerable period of time, beginning in 1911 and not reaching completion until early 1913. Frequent strikes appear to have slowed progress. Perry House was the highest building in Brisbane on its completion and its construction was followed with great interest by the Brisbane community. Perry House was then the tallest building in Brisbane with every floor occupied by the Perry Bros business activities and storage of goods. An extra storey was added in 1923. Perry House is still believed to be the tallest timber structure in the southern hemisphere. In the intervening years, Perry House was used as a commercial building and even by the US Military during World War Two. In 1996 after a substantial redevelopment, the heritage listed Perry House was opened as the Royal Albert Hotel.